Talaria at Burbank is a premium residential rental community to be built in the heart of the Burbank Media District, across the street from The Burbank Studios, Clear Channel and Warner Brothers, and a short distance from The Walt Disney Company and Providence St. Joseph Medical Center. The project is being proposed as the first LEED-certified green residential community in the City of Burbank. 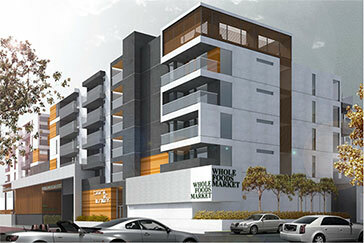 Talaria’s exclusive retail tenant is a Whole Foods Market open to all. In 2008, Burbank’s Mayor at the time, Dave Golonski, and BWP met with the Cusumano Real Estate Group to discuss ways to improve the sustainability of their operations. The Cusumano Group took the challenge of improving water and energy efficiency to heart. On the energy front, they tuned-up nearly 500 residential air conditioners (A/C) through BWP’s Air Conditioning Tune-Up program. A/C units that needed to be replace were upgraded with high efficiency options. They also replace thermostats, upgraded lighting, and installed high performance “cool roofing” material to reduce the solar heat that enters a building through the roof. In addition to saving both energy and dollars over the long-run, the Cusumano Group also received BWP rebates for their energy-saving actions. The Cusumano Group has been even more proactive with water conservation. They have replaced over 1,300 old toilets with High Efficiency Toilets, the most water efficient toilets available. These toilets use just 1.28 gallons per flush compared to as many as seven gallons per flush of older toilets. The Cusumano Group also installed low-flow showerheads and low-flow kitchen and bathroom faucet aerators in over 1,200 Burbank apartments. “We are really surprised by how effective the conservation programs are and the amount of water we were able to save after implementation of our conservation plans,” Michael Cusumano, Vice President of the Cusumano Group stated. Exactly how much water was saved? Water consumption was reduced by 30%! THANKS TO THE CUSUMANO GROUP FOR EMBRACING SUSTAINABILITY! “Currents” Magazine, June 2009 Posted on November 25, 2009.